Measuring and recording blood pressure is very important as diseases and any health problems in a patient can be easily determined by fluctuations in their blood pressure. It is therefore important for a CNA to learn this skill as maintaining a constant record of a patient’s blood pressure is one of their more important tasks. Having an accurate and timely record will help the physician to determine the proper type of medication and treatment that the patient would need. This is a more technical skill than other CNA tasks but it also entails a good glimpse into the physical condition of the patient. The first step is to knock on the patient’s door and introduce yourself and explain to them why you have come to their room. Be courteous in greeting the patient and also explain the step-by-step process of taking and recording blood pressure so they will know what will be done and which can also help them relax and cooperate with the process. Help the patient to get into a comfortable position either in a lying or sitting position whichever is more comfortable to the patient. Make sure that the equipment that you will be using is also within your reach. Start by washing your hands and cleaning your equipment. Make sure that you also use the proper personal protective equipment for the procedure. After this, make sure that your patient is in a very peaceful and comfortable surroundings by turning down the volume of the radio or by closing the door to eliminate the noise coming from outside the room. Then, select the appropriate size of cuffs that you will be using on the patient. Wrap it around the arm of the patient just above the elbow area. Make sure that you have an easy access to the cuffs and the device that will release the air pressure from it. Next, try to find the brachial artery in the arms which is located in the area where the elbow bends and then put the stethoscope’s bell over it. Start pumping air into the cuffs by pressing the bulb of the device and then watch the dial until the needle points to the appropriate point. It should be between 150 and 180 mmHg and then stop. After this start releasing the air from the cuffs slowly and watch the dial as well. Listen carefully to the earpiece and watch where the needle is during the first pulse. Take note of it and write it down on your form. Continue listening for the pulse until you come to the last and record also the level to which the needle was pointed for that. The first number is the systolic number while the last one is the diastolic. Remove the cuffs from the patient carefully and then proceed to get them in a comfortable position. Dispose of your gloves in the trash can and wash your hands thoroughly after use. 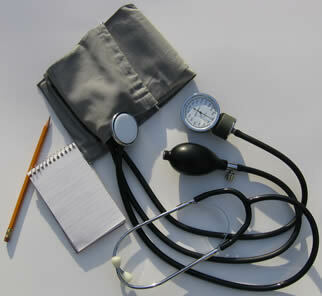 Clean the earpiece of the stethoscope well with the appropriate cleaning solution.